Welcome to my website, dedicated to all things Mott The Hoople and Ian Hunter. I've tried to cover most things the casual and dedicated fan could ask for as detailed in the following list, so hopefully you'll find what you're looking for. For the uninitiated, Mott The Hoople were a five-piece British rock band in the 1970's, best known for their hits All The Young Dudes and Roll Away The Stone. They were formed in 1969 when Hereford band The Silence signed to Island Records and were paired with Shropshire lad Ian Hunter. They soon gained a reputation as a must-see live act, but couldn't translate their live drawing power into record sales so after four poor-selling albums they split in early 1972. David Bowie heard of the split and offered to help, gifting them All The Young Dudes. The band enjoyed long-awaited commercial success on both sides of the Atlantic, but personnel changes and the pressures associated with success caused the band to split at the end of 1974. Since then they have gained almost legendary status, with bands as diverse as Def Leppard and The Clash citing them as a major influence. My archive of stuff that doesn't fit in well anywhere else, including an in-depth look at the sessions Mott The Hoople recorded for BBC radio, an Ian Hunter interview, a Mick Ralphs interview and a tour programme from Mott's cancelled UK tour with Mick Ronson. My own in-depth look at the story of Mott The Hoople, from the band's formation to their break-up and the reunion concerts. Plus fan-contributed essays as well. A listing of Mott The Hoople and Ian Hunter in print, including Ian's famous Diary, Campbell Devine's Mott The Hoople Biography, and the Outsider and Just A Buzz fanzines. My comprehensive review of every major USA/UK Mott The Hoople and Ian Hunter release. I've also included British Lions, MOTT, solo albums and various offshoots (eg Widowmaker). The reviews are as I see them, and my honest opinion (and no, I don't praise everything in sight - some albums only get a 2 out of 5 review!) I've also cross-referenced everything so if you're looking for a particular track finding it should be easy. Ditto live recordings - every officially-released live recording is cross-referenced, so again finding a particular recording should be easy. Most Mott The Hoople and Ian Hunter songs have been transcribed, so you shouldn't have any difficulty singing along. 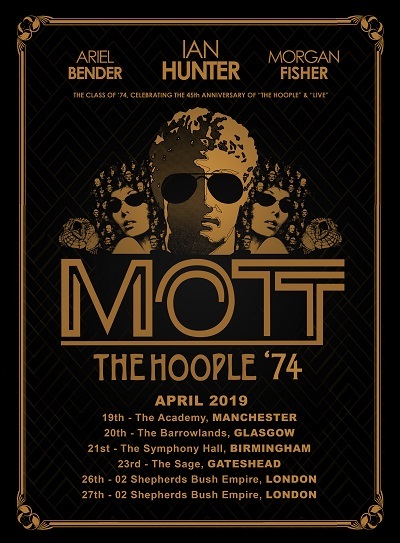 The latest news from the Mott The Hoople and Ian Hunter camp, including forthcoming releases and any upcoming gigs. My gallery of high-quality live photos of Ian Hunter and Mott The Hoople. No other site gives you more! A few songs have been transcribed for guitar and some for the piano. I have listed every Ian Hunter gig that I know of, together with gig reports from various 1997 and 1999 gigs. I maintain a comprehensive set of links to other Mott The Hoople/Ian Hunter websites. In addition, if you'd like to meet fellow fans to discuss anything Hunter/Mott, then Facebook is the place to go. Details are on my WWW Links page. I would like to thank Rory Musil, Kevin Medcalf and others whose names I've forgotten who helped me out in the early days (before I bought a scanner) by scanning a few images in for me. I would like to thank the numerous contributors to the lyrics project, who either transcribed lyrics or suggested corrections. I would like to thank Sven Gusevik and Justin Purington for their hard work in putting together the Outsider and Just a Buzz fanzines (which I have plagiarised shamelessly), and without which my knowledge would be somewhat poorer. Blowing my own trumpet I know, but I have put a few words together about myself, and this site, together with my philosophy behind trying to make this site accessible to all. The Content, Trade Marks and/or any other part of www.hunter-mott.com (the Site) may not be used, reproduced, duplicated, copied, sold, resold, modified, or otherwise exploited, in full or in part, for any purpose without my prior written consent. In particular, you are not permitted to republish any part of the Site (including the Content) on another website, in any other medium (print, electronic or otherwise) or as part of any commercial service without my prior written permission.